I have built and patented a Motor that runs on Magnets, not Electro-magnets. My first model is very crude, this one is estimated to produce ¼ HP. I have the equation from Brown University to show the Horsepower it makes. I will want to know what your working on and what your goal is, also please don'e forget to give me you contact information. There have been estimates that this could be built to have 200 HP per cylinder with larger magnets. This first model is very crude, I built the parts by hand. I was looking to build another more efficient model, not rebuild the one i have for many reasons. Marketing is not my strong point, I'm an inventor and an artist. I want to build a more efficient model then sell the patent to a company who can put this into production. Either you are a company who has the means to build this or an individual who can back this. I do have a short video of this running. Clean and free energy. No fuel to burn or outside source of energy. This is the Power source to a generator. It can be scaled up to be a very large energy plant or small enough to run automobile generating systems for electricity. e. There are reasons that others before me have tired and have not succeeded. It took me 21 years to see what stopped this from happening. If you are qualified and interested in doing this together, in some fashion, we should talk. It took me 21 years to make this run. I have built a crude model, made the parts by hand if I could not find what I needed. I'm a welder and an artist. This motor runs on permanent magnets. My Patent attorney would not write my patent until he watched this run. He also has a background in physics, engineering and magnetism. I have a short video of this running, to qualified people. Contact me if you're interested and we can talk. This motor will run itself with no other outside source of energy. I have built and patented a Motor that runs on Magnets, not Electro-magnets. My first model is very crude, this one is estimated to produce ¼ HP. There have been estimates that this could be built to have 200 HP per cylinder with larger magnets. This first model is very crude, I built the parts by hand. I was looking to build another more efficient model, not rebuild the one i have for many reasons. Marketing is not my strong point, I'm an inventor and an artist. 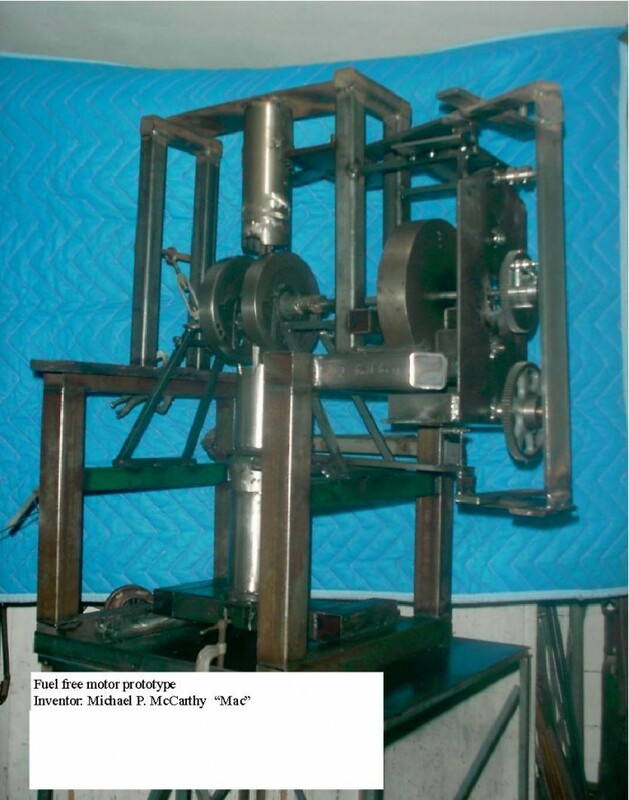 I don't have the means to build this next model so I'm going to sell half of this Patent for $250k and a 5% royalty. 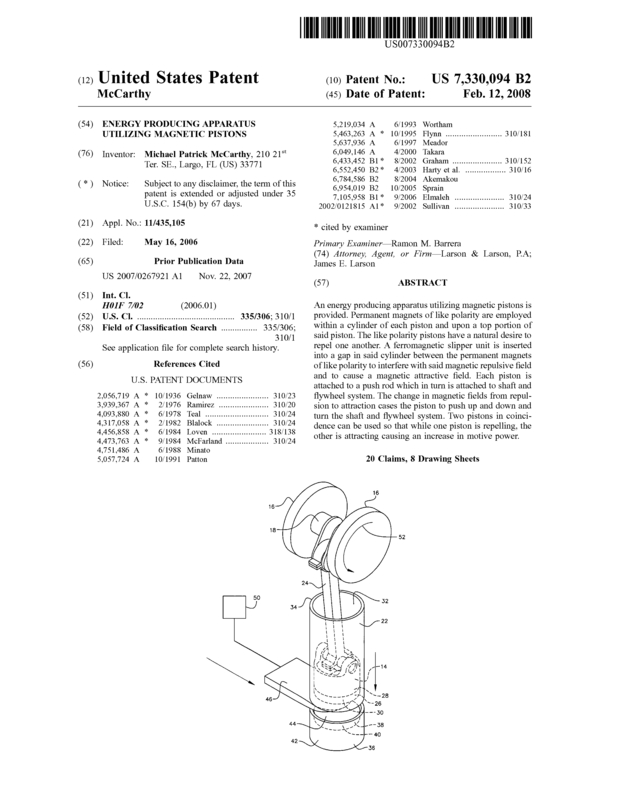 Page created at 2019-04-26 17:48:45, Patent Auction Time.